Don’t waste your vacation chasing paradise. Stay right in the heart of it. On two surreal islands, you’ll spend your vacation doing what you love! 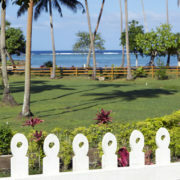 Ride horses on pristine beaches, interact with wild dolphins and sip cocktails on your private patio. Blend your everyday passions into this tropical Fiji getaway. Maybe sit down to a movie at your resort theater or play a nine-hole adventure golf course. Do you prefer brandy at swanky bars or margaritas at swim-up bars? 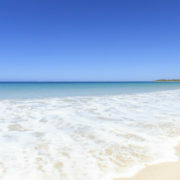 Would you rather put on a suit and dine with class or feel your bare feet in the fine sand as you eat? Either way, this vacation has got you covered! From adventure to relaxation, from wildlife to waterfalls, everything is right at your front door. 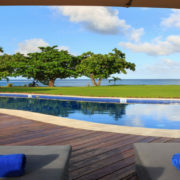 This tropical Fiji getaway is flexible and can be tailored to suit your needs. All prices are in US dollars and correct as of April 3, 2019. Pricing is from “per person” based on Double Occupancy (2 Adults) in hotels. Single Supplements apply. Upgrades available on request (upgrade supplements apply). No refunds allowed. Changes are permitted (fees may apply). Other restrictions may apply. Not combinable with any other offer or discounted vacation package. About Fiji reserves the right to adjust the amount of any outstanding balances at any time according to USA Exchange Rate variations. All taxes, VAT, GST & Fuel Levies are included in the Price unless specified otherwise. Prices may vary when you book your travel package and are not guaranteed until payment in full is received. 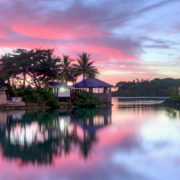 Airlines, hotels and tour operators frequently change their prices as a result of rate increases, fuel surcharges, government imposed taxes or fees. Prices may increase prior to full payment for those and/or other reasons. All prices, itineraries and routings are subject to change. After full payment, prices are guaranteed except only due to an increase in government imposed taxes or fees. By paying your deposit, you understand and agree to the possibility of such increases. Flights, where included, will be operated by Fiji Airways or their code-share partners; flight Taxes & Fuel levy included; Economy Flight Class of Service. Flights maybe based on Fares which can not be held in advance of purchase, same day ticketing may be required. 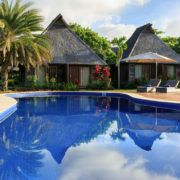 Contact About Fiji directly to get a firm quote based on current prices for your preferred travel dates. 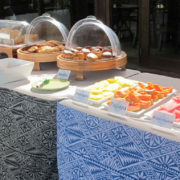 Pack your bags and head to your nearest Fiji international hub. 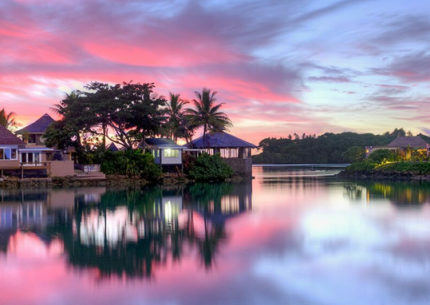 You’ll catch an overnight flight to Nadi, Fiji. On your way, you’ll cross the date late and lose 1 day. 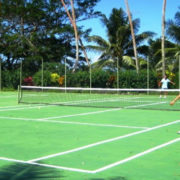 You’ll land in Nadi early in the morning before hopping on a short domestic flight to Savusavu. 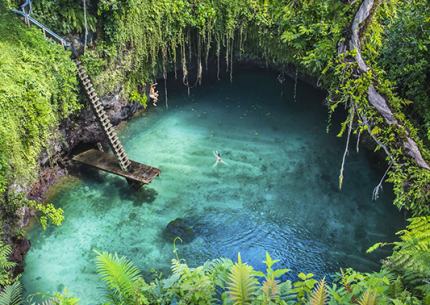 A short ground transfer will take you to your Fiji Resort. 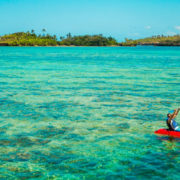 When you first witness the secluded tropical wonderland of Vanua Levu, you’ll be amazed that it’s only a mere 50-minute flight from the bustle of Nadi. 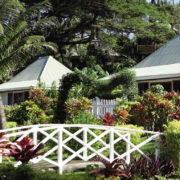 Your garden bure is a charming cottage in the very heart of Fijian splendor. 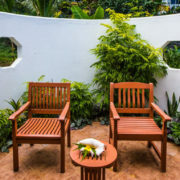 Intensely beautiful tropical landscaping borders your private patio. It will quickly feel like a more perfect version of home. 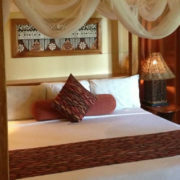 Right outside your bure, perfection awaits in the form of adventure, wildlife, luxury, and absolute tranquility. Koro Sun Resort & Spa is the ideal destination for anyone who understands the value of getting away from it all. There is always a great time to be had at the 9-hole adventure golf course for novices and experienced golfers alike. 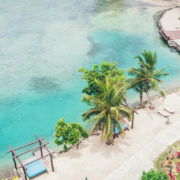 The charming Chululu Cruise and dolphin watching tour are great ways to get to know the surrounding waters, while waterfall tours, town visits, and pearl farm tours will allow you to know the island more intimately. 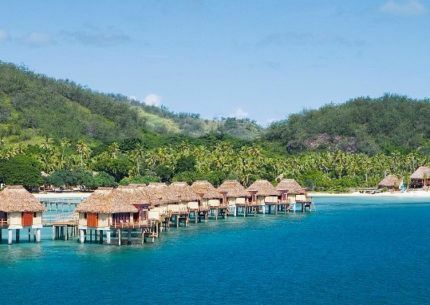 In this remote hideaway, no adventure is ever far away, whether it be snorkeling through infinitely impressive marine settings, joining a memorable Fijian cooking class, observing a Lovo cooking demonstration or just an icy cocktail. Even in this package where every moment is unforgettable, this day tour will surely be the source of most of your lasting memories. 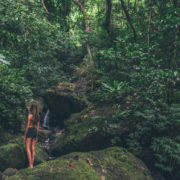 Cram as much adventure as possible into one day, beginning with a trip to an unreal waterfall hidden in the jungle. 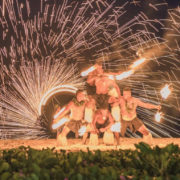 Take a dip, meet the villagers, and even enjoy a unique kava presentation. After your lunch in this surreal setting, set out on a kayak where the current will take you through vastly changing backdrops and lands you at an uninhabited island in the middle of the island’s largest salt lake. Finish off this incredible day with a one-hour couple’s massage in the award-winning Rainforest Spa, featuring an incredible Banana Leaf Body Wrap. Your skilled masseuse will take you to another level of serenity in a spa situated over a trickling stream with the jungle surrounding you. Whereas most scuba tours take you far from the coast, this two-tank package will have you diving at the most incredible dive sites that are a mere 5 to 15 minutes from the beach! 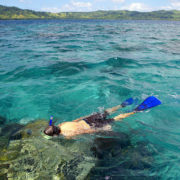 This means you can have a world-class diving experience, and be back to shore with daylight to spare and without feeling sluggish from a grueling boat ride. “The Soft Coral Capital of the World” and its colorful inhabitants are sure to make the very top of your list of greatest dive sites, no matter where your previous scuba adventures have taken you. A short domestic flight and shuttle service will take you to Natadola Beach on the main island of Viti Levu. 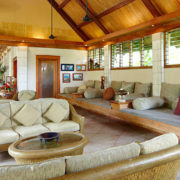 This luxurious resort on the most magnificent beach on the island is the sheer essence of Fiji. 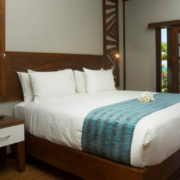 Your king-sized bed sits beside a glass door opening right to the pristine Natadola Beach. Enjoy meals made from seafood direct from the sea and fruit direct from the trees in your resort’s enticing restaurant, where your mouth will water as your toes dig into the soft sand on an impeccable beach. Superb chefs cook up the best local dishes, as well as Western and Asian cuisine, including delectable Indian Tandoori. Yatule Resort & Spa is quite simply the paradise that you envision when you close your eyes and dream of a world away from your arduous work life. On this impeccable beach, a local villager trots his horses through the sand offering rides to tourists. 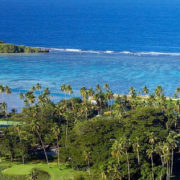 The best golf course in the South Pacific is just a few minutes away where the fairway runs alongside the stunning coastline, making one whole side a sand trap that you might actually aim for to take an impromptu walk on the beach. Non-motorized water activities are all complimentary and your resort will be happy to set up any excursions you may want to partake in. This island getaway is exciting, relaxing, and highly convenient all at once. A short shuttle service will bring you back to Nadi International Airport. Where you’ll fly from Nadi, Fiji to Los Angeles or San Francisco, California. After which, you’ll take a flight back home. You’ll gain a day as you fly over the pacific and have some time to relax at home.